They went from standing in frostbite-prone temperatures reaching -40 degrees below Fahrenheit to embracing the familiar, Floridian climate nearing 110 degrees. After, they went back-to-back with a wind turbine towering more than 40 feet tall, far more powerful than the average jet engine. This was just a glimpse of what some top administration officials from Florida International University (FIU) got to experience from an all-access, behind-the-scenes tour of the FCA US headquarters in Auburn Hills, Michigan, which contains some of the company’s most private, highly restricted testing facilities. It didn’t end there, either. Top executives from FCA US took time to sit down and discuss the state of the industry and its future workforce with FIU faculty, administration and alumni currently working at the company. What’s the goal? Pioneer a strategic relationship between leading institutions dedicated to top-of-the-line, hands-on education with industry-level expertise to help both college students, and the company, succeed. “By partnering with specific schools, we’re able to strengthen the future of not just the company, but the people that will lead the future of the automotive industry,” said Stefanie Thornton, Head of Talent Acquisition at FCA. 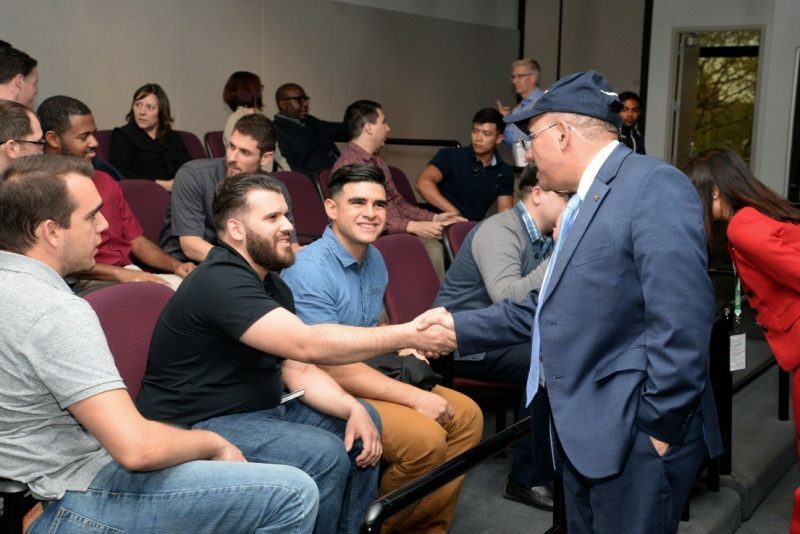 Shaking hands, the dean of FIU’s College of Engineering and Computing Dr. John Volakis meets with current FCA US employees who are also recent graduates of FIU. FIU has been at the forefront of innovation in STEM (science, technology, engineering and math) education for their students and for young people across southern Florida. Each year since 2014, FIU students and faculty have helped more than 1,200 students throughout the state with Engineers on Wheels, a program that exposes K-12 students to careers in STEM through hands-on lessons in subjects like mechanical engineering. Due to its dedication of helping kids discover their futures, FCA US partnered with FIU on the initiative with the donation of a Ram ProMaster in 2014, along with a $15,000 gift from the Chrysler Foundation to help establish the program. Now, as the program continues to inspire young engineers in the making, FIU and the company are beginning to establish new opportunities for college-age students to take their education to the next level. 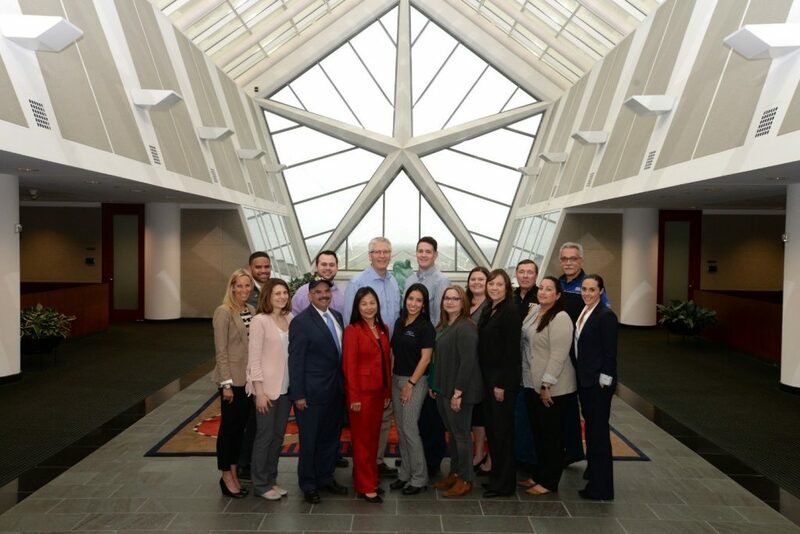 Since launching their partnership in 2014, FIU and FCA US have explored different ways to bridge the gap between FIU’s Miami campuses and the company’s Auburn Hills complex, as well as bridging the shift from classroom to the workforce. Currently, FIU’s Department of Mechanical Engineering within the College of Engineering and Computing is building the framework of an automotive engineering curriculum. The program will give students the opportunity to receive specialized instruction that caters to their career interests. Like FCA, FIU continues to invest in its future and to take pride in what it does. With plans to more than double its engineering faculty from 104 to 214 by 2020, FIU also hopes to increase the number of engineering students by 20% by 2020 . The school also hopes to build a state-of-the-art 225,000 square-foot engineering complex. Business students can expect to have more opportunities to engage and work with FCA US brands. Through the FCA US Southeast Business Center in Orlando, Florida, students within FIU’s College of Business (which currently ranks No. 7 in undergraduate international business programs according to U.S. News & World Report’s Best Colleges) will have the opportunity to enter a marketing case competition using the Chrysler, Dodge, Jeep®, Ram and Fiat brands. The goal, in addition to sparking career interests in the automotive industry, is to give students from throughout south Florida unparalleled opportunities to experience the company’s brands, and to gain industry-level experience. 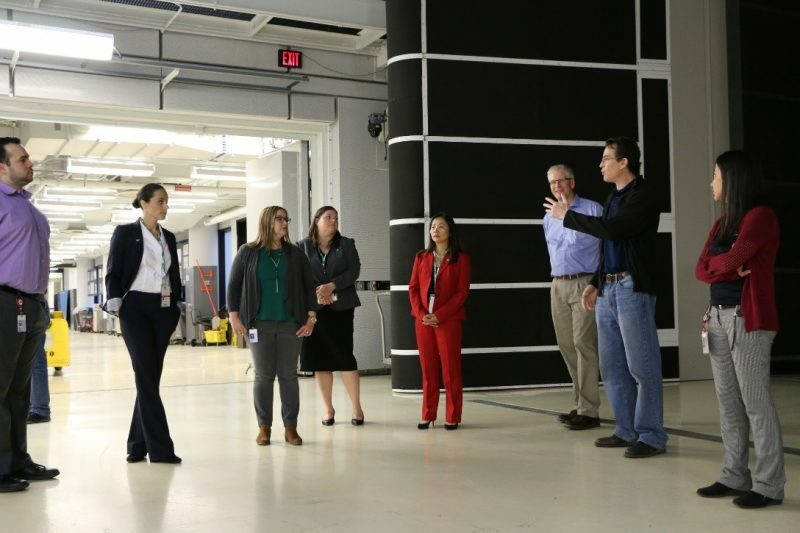 Standing in the entrance of the wind tunnel testing facility, two FIU alumni working at FCA US and FIU administration hear more about the rigorous aerodynamic testing process vehicles must undergo before entering the market. Currently, more than 27 FIU alumni work throughout southeast Michigan at the FCA US Auburn Hills complex and its manufacturing plants. More than half of all FIU alumni currently working at FCA US joined since January 2017. The company’s profile of summer interns continues to hold true to the company’s value of diversity within the FCA workforce. Of 275 summer 2018 interns, more than 44% have a home address outside the state of Michigan, representing more than 67 colleges and universities from across the country. In addition, 50% of FCA US summer 2018 interns are women and ethnic minorities—making it the most diverse group of interns at FCA US, ever. Getting a spot in this summer’s intern class was no easy feat—out of a pool of more than 10,990 applicants, less than 3% were hired—one of the most competitive pools of applicants in the company’s history. FIU is just one of many partnerships already underway with FCA US University Relations. Schools such as The University of Michigan–Ann Arbor, Michigan State University and Ohio State University are among the list colleges and universities already partnering with FCA US. 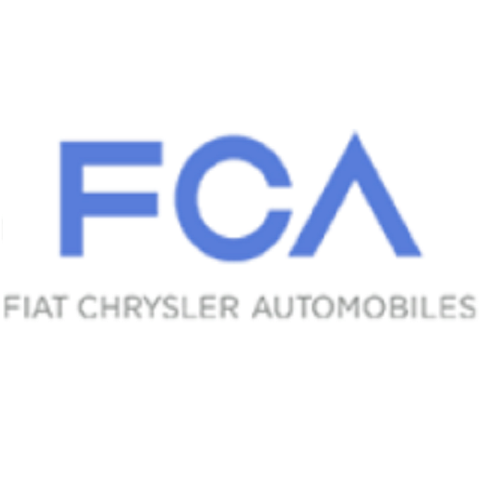 While the company continues to develop the early stages of its strategic relationships with leading institutions like FIU, it goes without saying FCA is dedicated to investing in the future of the automotive industry and the people making it all possible.